During my visit to Hyderabad in December last year, I was intrigued at the sight of fresh pods of pigeon peas (tooror arhar dal) being sold on the roadsides in heaps like green peas. Arharki phalli is not common in north India, and I got curious about its use in the kitchen. Are pigeon peas as popular as green peas? Can all legumes be put to good culinary use like matar and green chickpeas? I got the answer when I visited an organic farm called Aiyor Bai in Ranga Reddy district, 55 km from Hyderabad. The farm belongs to Madhu Reddy, who practises mixed cropping on her ancestral land. She grows a lot of lentils at the farm as lentil crops fix nitrogen in the soil and are important for organic farming. We foraged for a few greens and vegetables and decided to cook a farm-to-table meal for ourselves. The fresh legumes of toor that I had plucked reminded me of edemame (fresh pods of soybean), a healthy snack popular in Japan, China and Korea. I boiled them in salted water and enjoyed them just like edemame, sucking the seeds out of the pod. The fresh pigeon pea seeds get buttery when boiled like this. Later, while talking to Reddy and Nirupama, another friend, about the culinary uses of pigeon peas, I learnt that they are also used to make bisibelebhath. This is a khichdi popular in south India. The recipe is complex, involving roasting of many spices and powdering them separately. But Nirupama explained a simpler method, which I tried. The ingredients include white rice, fresh pigeon peas, grated coconut and spices such as coriander and mustard seeds, chillies, cinnamon and cashew. Onion, bay leaves, sambhar powder, hing (asafoetida), ghee, chopped vegetables and tamarind extract are the other ingredients. Once ready, the dish is not only delicious, but also very aromatic. Another interesting recipe is “toor lilvana ghugra”, a deep fried, samosa-like snack popular in Gujarat. Fresh pigeon peas, or toorlilva in Gujarati, are a favourite ingredient during winter in the western state. The ghugra, stuffed with toorlilva, is similar to gujiyain north India and can be found in every nook and cranny. Combining it with fresh garlic shoots enhances the flavour of this seasonal recipe. It would not be an exaggeration to say that winter for Gujaratis is incomplete without this scrumptious snack. In Maharashtra, toor legumes are called turichya shenga and the seeds are called toorlilva, similar to its Gujarati name. 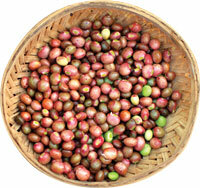 Toorlilvaare used extensively in Marathi and Gujarati cuisines. While they are common in meals like tahiri (vegetable pulao) and bisibele bhath, they can also replace green peas in seasonal curries. 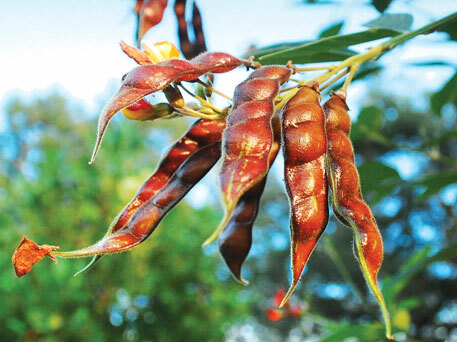 Pigeon peas are just one of the many varieties of legumes. Leguminous crops are grown in India mostly for pulses that constitute the staple source of protein for many. Some legumes are used as vegetables like lobiya, flat beans (sem), fava beans (bakla) and French beans, where the whole pod is eaten. The seeds can be stored once they are ripe and dehydrated and used as dry beans. These are loaded with nutrition and can be used in curries like rajma in north India, chowliusal in Maharashtra and avrekaisagu in Karnataka. Other legumes or pulses have a tough pod that is not edible. Chickpeas, pigeon peas, green gram, black beans and red lentil (masoor dal) fall in this category. These are consumed fresh only when the tender seeds are separated from the pod. Green chickpeas make a traditional winter snack for farmers in states like Madhya Pradesh, Bihar, Uttar Pradesh, Maharashtra and Gujarat. Farmers uproot the plant and let it dry partially in the sun. When they keep vigil on their fields at night, they burn the plants to keep warm. The green chickpeas get roasted and can be relished in this form. This snack is called hora in Madhya Pradesh, Bihar and Uttar Pradesh and hurha in Maharashtra and Gujarat. This nightly practice has become a winter ritual in these states. Rub ghee and salt into the flour, gradually adding water. Knead medium soft dough. Keep aside for 15 minutes while you make the stuffing. Pulse the pigeon peas in a food processor or pound them in a mortar and pestle to make a coarse paste. Mix with the other ingredients for the filling except oil, cumin seeds and hing. Next, heat oil in a pan or a thick-bottom iron kadhai. Add the cumin seeds and hing and let them splutter. Add the toorlilva mix and stir on low flame for 5-8 minutes till it gets a little dry and crumbly. Take it off the flame and let it cool. Divide the dough into 12-14 portions and make smooth balls. Roll out thin pooris from each ball. You might need more dough if you make thicker pooris. Place a generous filling of toorlilva in the middle of each poori, fold it like a book, seal the edges making sure no air is trapped inside. The edge can be pinched to make scallops. 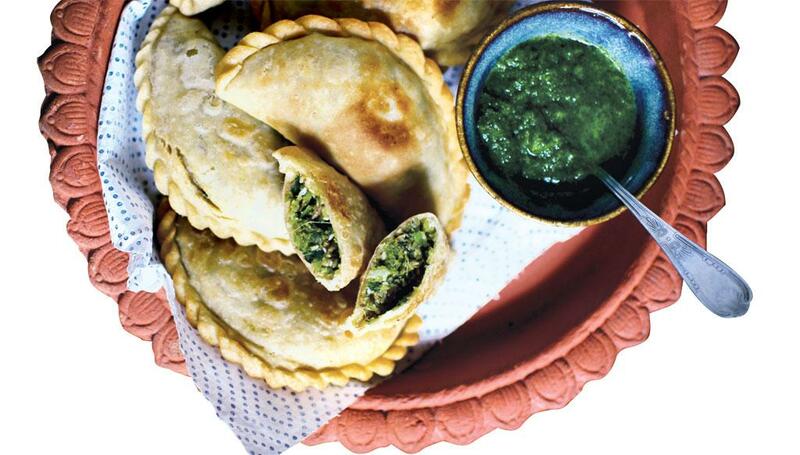 Repeat the process to make more such stuffed ghugras. Deep fry them in peanut oil in batches. Serve the toor lilva na ghugra with garlic and coriander chutney.